My oldest daughter, Jenn, starts the season of family birthdays with hers falling in mid-September. She lives out-of-state and far away but I wanted to do something 'homemade' and special for her. She and I 'follow' each other on Pinterest, and a few months ago she'd pinned a purse that linked back to Novita's Reversible Bag Pattern. Unbeknownst to her, I'd already been drooling over Yoshimi's versions of Novita's pattern that she'd made here and here. Eureka! This would be her 'homemade' birthday present. Not knowing what fabric she might like, figured one couldn't go wrong with denim. The lining was a pretty quilting cotton I'd been using in my recent quilt blocks and had totally fallen in love with the color and design and thought it suited Jenn's personality. ....zippered pocket, magnetic closures and a label. 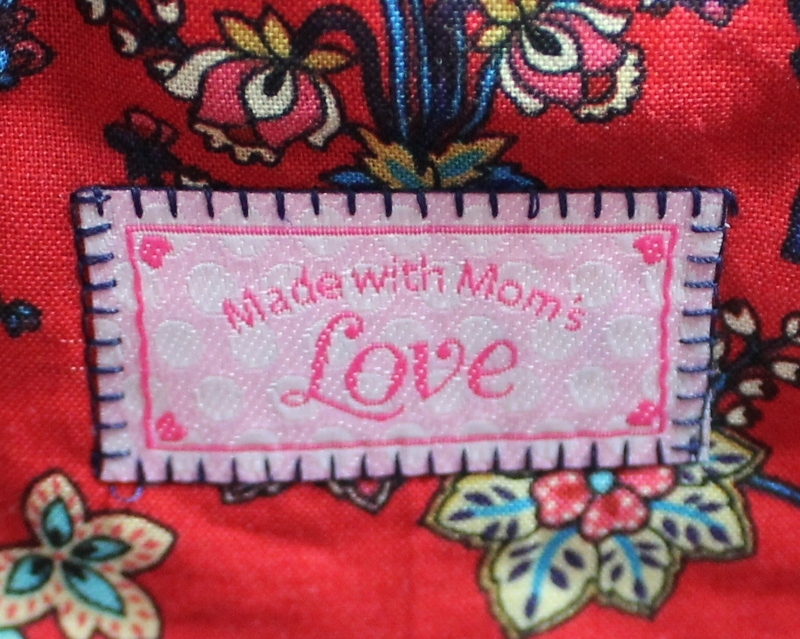 And because one can never have too many little zippered bags, made this one personalized for her. Struggled a little with the embroidery, as my machine does not do embroidery. This is how I did her name. Chose the font at proper size and printed it out on regular paper. You can see, below, how I cut out the basic shape then free-hand/traced it to my tear-away stabilizer. It worked better to have my tear-away stabilizer on the top of the right side of my fabric. Set my machine to a satin-zigzag stitch, lowered the feed dogs, held my breath! and free-hand embroidered her name. I think it turned out well. Probably could've used another going over, but I was afraid I'd mess it up at this stage and needed to get in the mail and on its way to the birthday girl. 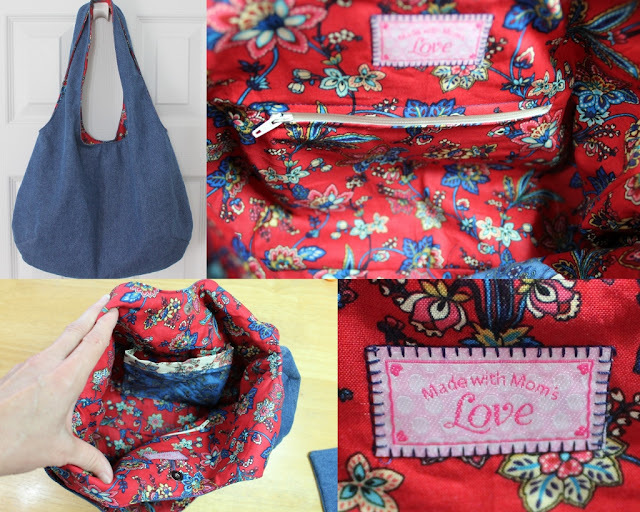 Because I added pockets and closures, this bag is not reversible. It's an oh-so-cute bag that hopefully Jenn will enjoy and use. You are so welcome! I'm so glad you like it. Wow.. Just pinned this bag...great job!!! That is such a great compliment coming from someone with your sewing skills! Thank you so much Kathy! I am so looking forward to participating in your 'make a garment a month' challenge! I'll send an e-mail your way and a blog post will be up later talking about the challenge.